Bill Clinton said he “would grab a rifle” and fight for Israel during paid speech. Bill and Hillary Clinton are under increasing scrutiny from the mainstream press over paid speeches they have given to big banks in exchange for millions of dollars. According to CNN, the couple has earned a total of $153 million in lecture fees from companies and organizations affiliated with the financial industry. But the media has been conspicuously silent about the large sums the Clintons have raked in from paid addresses to pro-Israel organizations, including the Jewish National Fund (JNF), which directly participates in the ethnic cleansing of Palestinians and Bedouin citizens of Israel. 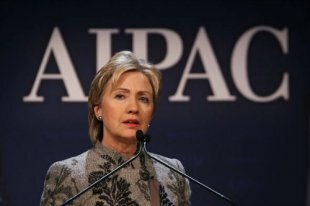 An evaluation of Hillary Clinton’spublic disclosures from 2001 to 2015 shows that she and Bill, and their daughter, Chelsea, have earned roughly $4 million in speaking fees from pro-Israel organizations, including JNF and organizations allied with the right-wing government of Israeli Prime Minister Benjamin Netanyahu. The vast majority of these documented payments—$3,599,999—have gone toward the Clintons’ personal income, and up to $450,000 has been funneled into the Clinton Foundation. Bill Clinton’s presidency ended with the collapse of the U.S.-led peace process at Camp David in 2000. After leaving office, Clinton publicly blamed Palestinian Authority Chairman Yasser Arafat for the failure of negotiations, explicitly violating a promise he made to Arafat at the start of the Camp David process. The former president thus reinforced then-Israeli Prime Minister Ehud Barak’s infamous talking point that there was “no Palestinian partner” for peace. Bill Clinton declared in the summer of 2002, at the Toronto chapter of the pro-Israel group Hadassah-WIZO, “If Iraq came across the Jordan River, I would grab a rifle and get in the trench and fight and die,” reportedly earning wild applause from attendees of the $1000-a-plate dinner. According to a New York Post reporter in attendance, Clinton again blamed Palestinians for his failure at Camp David, “accusing Arafat of making a ‘disastrous mistake’ by turning down past peace proposals that would have given the Palestinian leader control of 97 percent of the West Bank.” Clinton earned $125,000 for the speech. Bill Clinton received $425,000 for two speeches to Friends of the Simon Wiesenthal Center, a right-wing group that generally supports the Likud-run government of Benjamin Netanyahu and is hostile to Democrats. Simon Wiesenthal Center president Marvin Hier, who addressed the 2000 Republican National Convention, has compared President Barack Obama to Neville Chamberlain and described the Iran nuclear deal as “another Munich.” In 2011, three years before Bill Clinton’s second paid speech before the organization, Hier accused then-Secretary of State Hillary Clinton of “a sell out” to anti-Semitism for opening diplomatic discussions with Egypt’s democratically elected Muslim Brotherhood. While unmentioned in public disclosures, the Clinton Foundation website notesthat the American Israel Public Affairs Committee, the main arm of America’s pro-Israel lobby, contributed between $10,001 and $25,000 to the organization for at least one speech delivered by Bill Clinton, with the exact date or amount paid unspecified. S. Daniel Abraham, the Slim Fast diet mogul who serves on the board of AIPAC, has given as much as $5 million to the Clinton Foundation. Through a series of front groups, ad campaigns and Israel propaganda tours for freshman members of Congress, AIPAC spent upward of $40 million last year in a failed attempt to derail the Obama administration’s Iran nuclear deal. Among the Clintons’ pro-Israel speaking fees, only one was received from an organization that could be classified as part of Israel’s peace camp. The Abraham Fund, which says its aim is to “promote coexistence and equality among Israel’s Jewish and Arab-Palestinian citizens,” paid Bill Clinton $125,000 for a single speech in 2002. Chelsea Clinton raked in as much as $325,000 in speaking fees from the United Jewish Appeal and its affiliate, the Jewish Federations, a pro-Israel umbrella group of Jewish American establishment organizations that actively combats the Palestinian-led BDS (boycott, bivestment and sanctions) movement. She remits 100 percent of her speaking fees to the Clinton Foundation, where she is a board member and helps decide how the foundation spends its $180 million annual budget. Bill Clinton took in six-figure lecture fees from pro-Israel synagogues around thecountry. Our calculations include only Jewish instutions whose pro-Israel programming could be identified; we excluded hundreds of thousands of dollars in speaking fees paid to the Clintons by Jewish instutions whose online materials do not explicitly promote Israel. In addition, Bill Clinton received $250,000 for a speech to Univision Management Company, the media corporation co-owned by pro-Israel billionaire Haim Saban. As AlterNet’s Grayzone Project recently reported, Saban and his wife Cheryl contributed $5 million to the pro-Hillary Clinton super PAC, Priorities USA Action, this February. Saban has also contributed between $5 and $10 million to the Clinton Foundation. “I’m a one-issue guy, and my issue is Israel,” Saban said in 2004. Public records show that Bill Clinton earned a total of $549,999 in four speeches to the JNF. The disclosures do not mention the JNF’s most generous fee. JNF provoked an outcry within pro-Israel circles when it transferred half a million dollars to the Clinton Foundation through the Peres Academic Center to pay for a single speech by Bill Clinton. Bill Clinton later said he donated his large fee back to the Peres Academic Center, but there are lingering questions about where all the money went, including funds from the JNF. Formed in 1901, JNF has spent over a century driving Palestinians off their land, including through the creation of the paramilitary force euphemistically namedthe Green Patrol. Former JNF director Yosef Weitz outlined detailed plans for the mass ethnic cleansing of Palestinians in 1948, demanding that their villages be destroyed and they “be harassed continually” to prevent them from returning. In recent years, JNF has teamed up with the Israeli military, police and Christian Zionist donors to violently expel the residents of unrecognized Bedouin villages in Israel’s Negev Desert. Among them is Al Arakib, which as of October 2015, has been razed to the ground a staggering 90 times. Video below by Max Blumenthal, a co-author of this article, shows the destruction of Al Arakib by Israeli bulldozers in 2010 — the third time it was demolished — in order to make way for a JNF-funded “forest” and Jews-only town. The JNF is widely opposed in Palestinian civil society and controversial even within Israel, where it owns roughly 13 percent of state land and vows to lease it to exclusively Jewish tenants. Will Hillary Honor Her Commitments? Hillary Clinton has made her unflinching support for Israel a centerpiece of her foreign policy agenda. In November 2015, she promised to “reaffirm” the “unbreakable bond with Israel, and Benjamin Netanyahu,” suggesting she would adopt a friendlier posture to Israel’s right-wing leader than Obama had. In a July 2015 letter to mega-donor Haim Saban, which her campaign distributed to the press, Clinton declared “we need to make countering BDS a priority.” It was the first time in American history that a presidential candidate mentioned by name the grassroots movement to boycott Israel. Whether a Clinton presidency would alter the U.S.-Israeli special relationship remains to be seen. But as long as she honors the wishes of her family’s top contributors, as she has pledged to do, her argument for human rights must exclude Palestinians. The following list shows Bill and Hillary Clinton’s personal income from speaking fees to pro-Israel groups between 2001 and 2015, based on public disclosures. The following list shows the Clintons’ speaking events to pro-Israel groups, which were compensated by payments to the Clinton Foundation. The Foundation’s website does not provide information about the exact date of the engagements or the amount given.